Frank has several decades of well-tempered experience programming and designing large-scale urban design, commercial, healthcare and educational facilities. From the beginning of his professional career, he quickly demonstrated his ability to realize sizable projects. At Hillier, the third largest US architecture firm, he established a reputation for versatility, independence and effectiveness in delivering numerous building types. In private practice he prepared and executed a $ 14-million master plan for Stuart Country Day School in Princeton, which included four new buildings and numerous renovations over a period of 15 years. 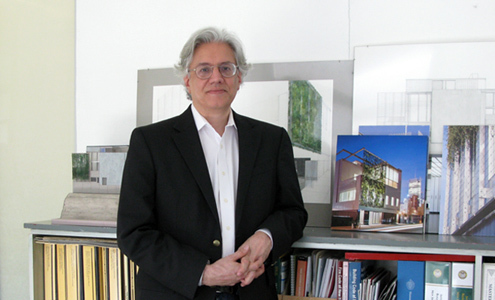 As Principal in Charge of Design at HACBM, Frank developed expertise on community-based urban design and housing projects where he earned broad respect for his vision and practical implementation, qualities which have made him a much sought after expert on regulatory design policy and strategic planning. He created education and housing prototypes that set control standards where design serves as policy for ongoing procurements. Frank’s sound judgment and agreeable manner make him most capable in guiding firm operations and efficient project management.